You can't argue that if there was ever someone who could provide valuable insight for a successful career, it would be one of the nation's Founding Fathers. 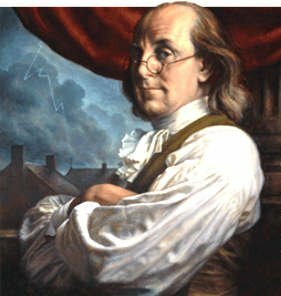 Benjamin Franklin had many important roles in his life that include scientist, musician, inventor, politician, author and entrepreneur. Considering the major differences between our job market now and the way people found occupations back then, it's no surprise that his is perspective on the working man is not only a reflection of his distinguished character but that of the core values of a good work ethic. You snooze, you lose -"Plough deep while sluggards sleep and you shall have corn to sell and to keep." Today there are a number of CEO's around the world who start their days earlier than most people. Ben Franklin claimed to have been up by 4 a.m. every morning. For those who aren't naturally morning people, try skipping the midday coffee, turning your TV and computer monitor off well before bedtime, and banning the use of your snooze button. There are no shortcuts in life -"Tell me and I forget, teach me and I may remember, involve me and I learn." Back then you couldn't simply take a crash course online or get cliff notes for an assignment. Being able to do something required being fully invested in learning it. Franklin actually dropped out of school at a young age. Instead, he was taken under his blacksmith father's wing and apprenticed at his brother James' printing shop. A true student of life, Franklin also ended up leaving the apprenticeship and began living on his own before the age of 18. Big egos get you little respect -"To be humble to superiors is duty, to equals courtesy, to inferiors nobleness." Even when you're at the top of your game, looking down on others will lead to a quick downfall. Humility is important because you can't get people on your side if they don't like you. Others around you will be more open to interaction when you have a charming personality. Productivity at work allows for playtime after it -"Employ thy time well, if thou meanest to gain leisure." This is similar to the notion of work hard, play hard. Often times people will be so anxious to get to whatever plans they have for the end of the work day that they lose sight of actually getting their work done. But there are risks to reward without paying your dues. It's simple: when you're at work, do it. By the time the day is over, whatever you were looking forward to will feel earn and well-deserved. Get up and get things done - "If you were a servant, would you not be ashamed that a good master should catch you idle Then if you are your own master, be ashamed to catch yourself idle." Imagine your life as if it were a job 24/7. While, yes, all work and no play makes you dull and miserable but that's why your work shouldn't be entirely detached from what you would consider play. Franklin had many slashes in his title because he was known for keeping busy. Whether he was inventing bifocals or doing work as statesman, Franklin was using each minute to its fullest potential.